That's what I thought you meant Philippe, but wasn't sure. Here's hoping this Sola Busca will come with a LWB that explains the named figures on the trumps and courts. But the Anima Antiqua series starts in 2017. That's what I understood from their post on facebook. The Sola Busca will be launched in 2017 as the first of the Anima Antiqua series. Just to add an extra "by the way" - the colouring of the Ancient Tarot of Marseilles Conver is not deliberately flourescent - it's a reproduction of a late 19th Century Conver rather than a late 18th Century one, hence the unfamiliar colouring. Which is gorgeous by the way. I have five copies (or maybe six; need to check) of the LoS Ancient Tarot of Marseilles. It really is one of my favourites. I wonder if these decks will be standard LoS size or some other format? 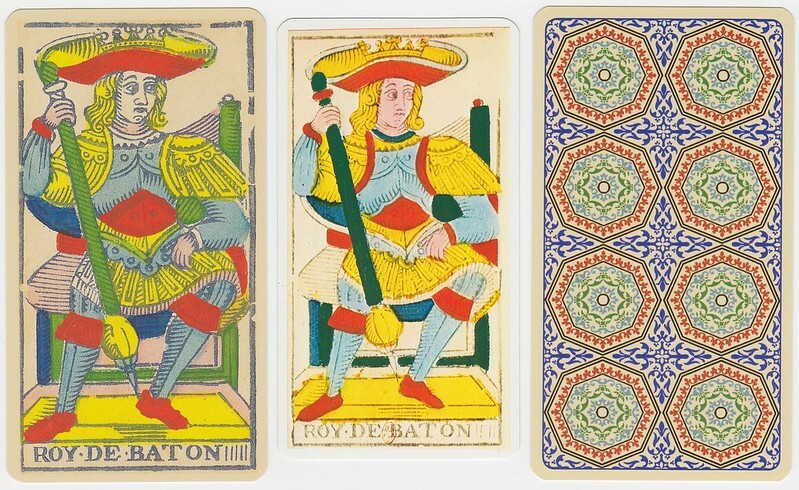 Just to add an extra "by the way" - the colouring of the Ancient Tarot of Marseilles Conver is not deliberately flourescent - it's a reproduction of a late 19th Century Conver rather than a late 18th Century one, hence the unfamiliar colouring. Great news! :-D I must admit I'm not a huge fan of their Sola Busca deck, it's quite good IMO, but it will be good to have a Sola Busca repro at a reasonable price point that one can rough up a bit. If anything, the Héron seems to me to be louder than the Ancient Tarot. That back design is a bit much, and may be distracting. It seems that Lo Scarabeo is also going to release the 62-card Tarocchino Mitelli next year, under the very same Anima Antiqua line. Look at page 8 of the in-page browser. Ha! I went to see their catalog....you may be right. The Sola Busca in the 2017 LS catalog looks like it won't have the black borders. Very promising.